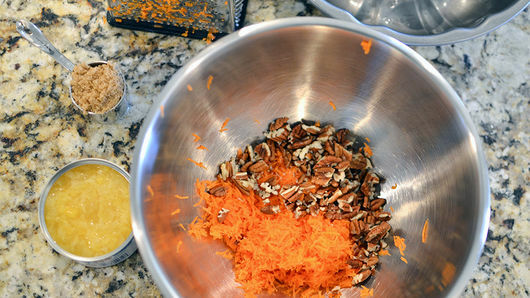 In large bowl, stir together 2 large carrots, peeled and shredded, 1 can (8 oz) crushed pineapple, undrained, 1/2 cup chopped pecans, 1/4 cup lightly packed brown sugar and 1/2 teaspoon ground cinnamon; set aside. Separate 2 cans (16.3 oz each) Pillsbury™ Grands!™ Homestyle refrigerated honey butter biscuits into 16 biscuits. Cut each into quarters. 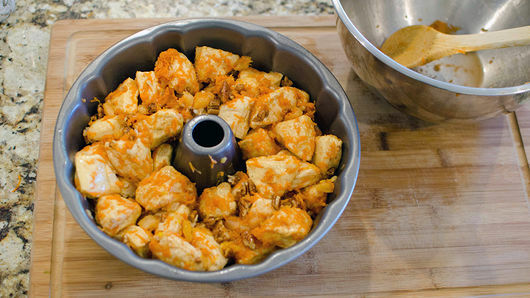 Add biscuit quarters to carrot mixture in bowl; gently toss to coat. Spoon coated biscuit quarters evenly into pan. Pour any remaining liquid over top. Bake 35 to 40 minutes or until thoroughly baked and toothpick inserted near center comes out clean. If necessary, during last 5 to 10 minutes of baking, loosely cover with foil to avoid overbrowning. Remove from oven; cool in pan on cooling rack 10 minutes. Run knife gently around edge of pan. Place serving platter upside down over pan; turn platter and pan over. Remove pan. 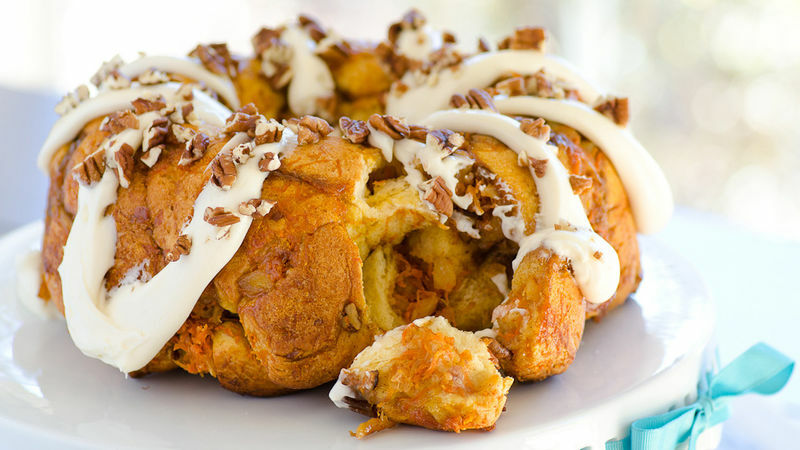 Spread or drizzle 1 container cream cheese creamy ready-to-spread frosting over top. Sprinkle with additional chopped pecans. Serve warm. If you like your carrot cake “loaded,” try adding golden raisins and/or flaked coconut to the mixture! Don’t like nuts? Leave them out! Prefer walnuts? Go ahead and substitute! Store leftovers in the refrigerator and reheat slices in the oven for about 5 to 8 minutes at 350°F.